In this project, one of the key requirements to support full rank spatial multiplexing via a virtual array of single-antenna legacy devices is that WATabit nodes must have sufficient Line of Sight (LOS) stability in mm-wave bands to support the high rates required to achieve real-time transmission and reception. However, due to high directionality of mm-wave links achieved via large phased array antennas to overcome the higher path-loss, mm-wave communication is highly susceptible to link misalignment due to nodal mobility such as rotation and translation. To maintain alignment, devices may require frequent beam search, exhaustively sweeping across all available beams at both ends to re-establish a high data rate link. Recent works have shown that this beam search overhead to address frequent misalignment can severely limit mm-wave link throughput. Such mobility induced link breakage is a key challenge in our system design, since it can interrupt communication in mm-wave bands, ultimately affecting the rank of spatial multiplexing in the legacy bands (or may even render it infeasible). To ensure mm-wave link LOS stability despite device mobility, in this project we further expand our diverse spectrum architecture, and exploit intensity measurements of visible light sources (430-770 THz frequency range) to track device mobility, and continuously adapt mm-wave phased array antenna beams without requiring any in-band beam-search. 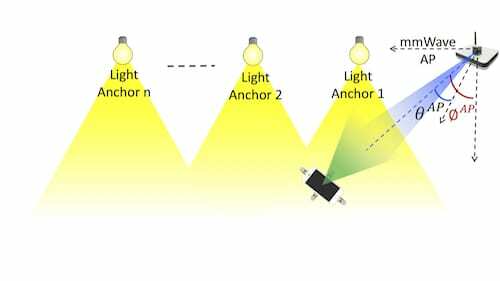 Our key idea is to exploit indoor light sources as fixed anchors, and track changes in mobile devices’ position and orientation by passively sensing light intensity from these indoor luminaries (even at unknown locations) using off-the-shelf light sensors. We then translate these position and orientation estimates to changes in LOS path parameters in the mm-wave band and continuously infer required changes in mm-wave antenna beams. In particular, we complete the following three objectives in mm-wave band part of overall system design. First, we devise a novel method to estimate a mobile device’s position and orientation simultaneously in 3-D using light intensity measurements from at least three light sources with unknown locations. For this, we employ a light sensor array for mobile devices and fuse measurements from multiple sensors to decouple orientation and position estimation, and present a recursive solution to estimate these parameters. Moreover, our method does not require any communication between light sources and mobile devices, or any coordination among light sources. Second, we design an algorithm to steer mm-wave beams at WATabit nodes to maintain beam alignment at the narrowest beamwidth level, enabling highest data rates and consequently full rank spatial multiplexing in the legacy bands despite device mobility. After initial beam alignment, our algorithm exploits the dominant LOS propagation of the mm-wave bands to track changes in the Angle of Arrival (AoA) and Angle of Departure (AoD) parameters of the LOS channel component by using the aforementioned light-based mobility estimation and steers the mm-wave beams along the LOS path. In particular, if a WATabit node infers that a change in its own steering is required, its beam can be re-steered immediately, without requiring any beam-search or feedback to other WATabit nodes. On the other hand, if it determines that another connected WATabit node’s beams should be changed based on its updated position and orientation estimates, a short feedback frame (<100 ) is sent to update the corresponding WATabit node’s beams as well. Moreover, this mobility tracking and beam steering is completely local to WATabit nodes, such that the legacy-band AP is oblivious to any changes, in accordance with the overall design principal of spoofing a virtual array using multiple WATabit nodes in the legacy bands. Third, we implement our design on a custom dual-band hardware testbed comprised of a custom light sensor array integrated with X60, our state-of-the-art configurable Software Defined Radio (SDR) mm-wave platform with fully programmable PHY and MAC layers, multi-Gbps rates, 2 GHz wide channels and a user-configurable 24-element phased array antenna which can be electronically steered in real-time. For luminaries, we use bulbs and off-the-shelf LEDs. We conduct extensive over-the-air experiments encompassing a wide range of scenarios with respect to the position and number of light anchors, and mobility patterns. We implement our design on a custom dual-band hardware testbed encompassing both mm-wave band transceivers with phased array antennas and indoor light sources, which enables over-the-air experiments. We first demonstrate that our visible light position and orientation estimation method tracks device mobility with high accuracy in practical indoor experiments. In particular, our method estimates position to within 40cm and orientation to within of the ground truth for more than 80% of measurement instances. These estimates are calculated without requiring the knowledge of light anchor locations. If these positions are known (e.g., in a planned deployment), the estimates can be further improved. Second, we study the beam steering capability of our system design by using the mobility estimates computed using visible light measurements. For this we consider multiple WATabit node trajectories to study device translation, and do separate experiments to study nodal rotation we well. Our results show that even with unknown anchor locations and practical phased array with non-uniform beam patterns, our algorithm can predict beams within two indices of the true highest strength beam for more than 90% instances across multiple node trajectories and anchor topologies. Moreover, without performing any further beam-search after the initial beam acquisition, WATabit nodes achieve link SNR within 1-1.5 dB as compared to an exhaustive search over all beams, which incurs significant overhead and interrupts data communication. As such, our design maintains beam alignment at narrowest level with no beam-search overhead after the initial alignment. Our experiments further show that a small local search around the predicted beam, with a small radius of only 2-3 beams is sufficient to achieve within 0.5 dB of maximum possible link SNR, albeit incurring only a fraction of overhead compared to an exhaustive search. Finally, we also develop a trace- and model- driven WLAN simulator to explore a broader set of operational conditions beyond the capabilities of our hardware platform, including multiple clients, different mobility patterns and client speeds. Our extensive experiments demonstrate that even with the maximum feedback strategy (separate packet for each beam-steering inference), our system achieves beam steering with less than 1% in-band beam-steering overhead for most scenarios with moderate to high client mobility, incurring 15× to 30× lower overhead than 802.11ad (current IEEE 60 GHz standard) based in-band beam-searching. Moreover, with light assisted beam steering, we demonstrate between 2x and 3x improvement in throughput by avoiding beam-search overhead in most cases, and our system performance scales much better with speed and client density as compared to the IEEE standard based systems. M.K. 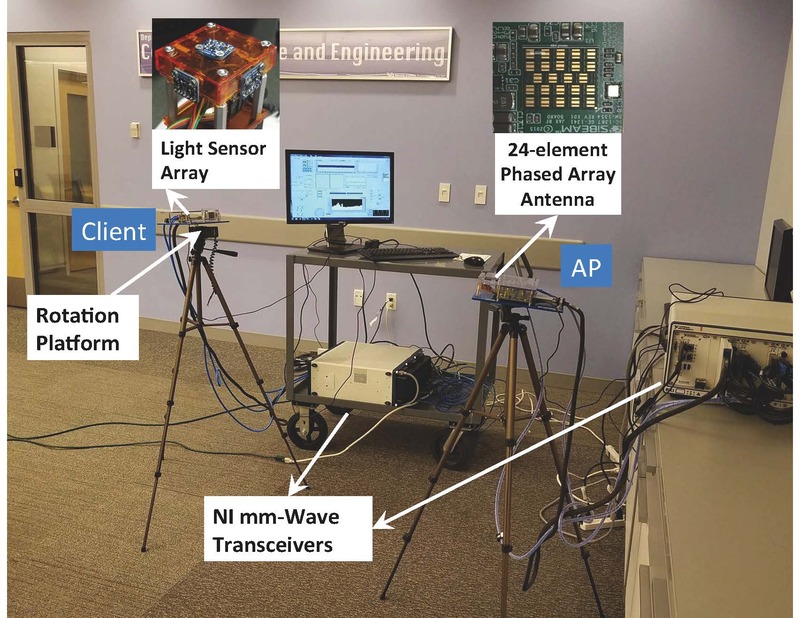 Haider, Y. Ghasempour, and E. Knightly, “SearchLight: Tracking Device Mobility using Indoor Luminaries to Adapt 60 GHz Beams,” in Proceedings of ACM MobiHoc 2018, Los Angeles, CA, June 2018.